Yeah, water bottles are a dime a dozen these days, so why would we waste our precious time writing about one? Well, there’s something novel about this one, which is a rare thing to hear when the subject is water bottles. This one’s made of plastic, that’s not new. BPA free, that’s great, but still not new. Screw top cap. Hmmm, nope, not new either. So what’s the deal? Well, we all know that traditional water bottles and shoulder bags, briefcases, handbags, and other similarly shaped totes, do not go together. Like, at all. 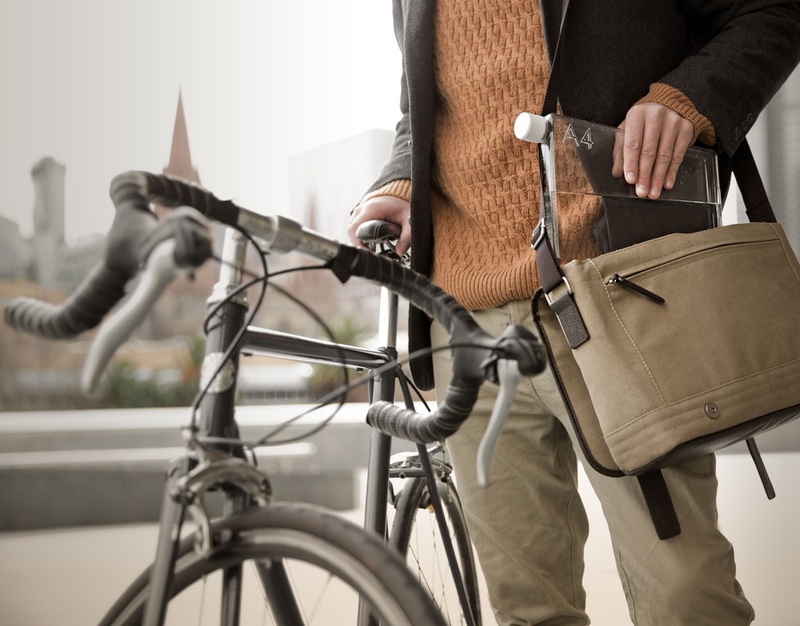 No matter how you slide it in or lay it, the darn thing just doesn’t get along with the slim rectangular nature of such bags and their contents, including laptops, binders, books, notepads, envelopes, clipboards, wallets, and other items. Either the water bottle causes an unsightly bulge in the bag, even making it difficult to close the outside flap, or it simply doesn’t fit at all. And it certainly never slides in between things. As can be seen in the photo above, the “memobottle” is a game changer. Goodbye, round cylinders of frustration, hello sleek, flat, and narrow with corners. It’s true, there are already bottles on the market that take their cues from military canteens or flasks, but “memobottle” takes it to the next level. 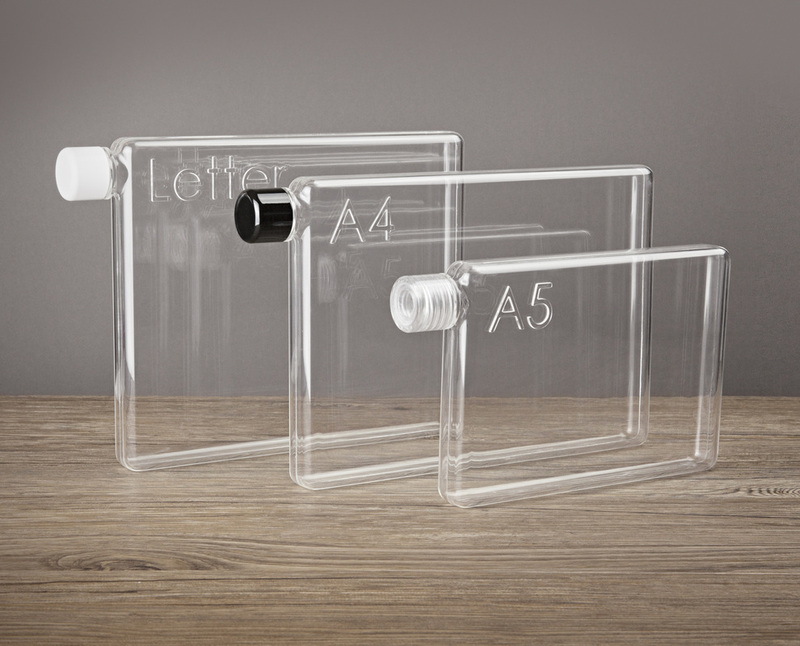 The bottles come in three different sizes, A5, A4, and letter, and literally look like transparent stacks of paper…that you can fill with liquid. We love that this handy design trick makes the water bottle more portable. Made from Tritan™ copolyester (a type of plastic manufactured by Eastman), The “memobottle” is also dishwasher safe, can handle freezing to boiling contents, hold from 750mL up to 1.25L of liquid, stand up on its own, and take a beating. On why the makers used a plastic material, they explain on their site and their old Kickstarter campaign page that reusable plastic is more environmentally friendly than stainless steel or aluminum given the manufacturing processes involved with all three materials when considering raw material to production, even when taking into account recycled inputs. They don’t comment on glass as a material option, however. Right now, you can pre-order your “memobottle” of choice, with delivery expected to take place in March-May of this year, and help combat single-use bottle syndrome. Give it a slide and surprise your office mates.